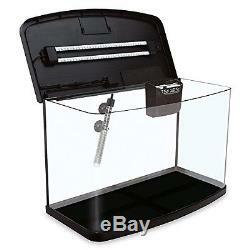 New Interpet Tropic LED Complete Aquarium Tank Kit, 32 Litre, 50 cm, Fish Light. 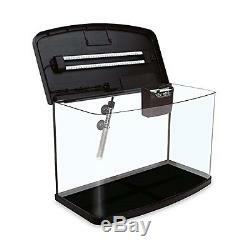 Interpet Tropic LED Complete Aquarium Tank Kit, 32 Litre, 50 cm, Fish Light New. The Interpet Tropic LED complete aquarium kit comes with everything you need to get started. These are designed to be efficient as well as create bright yet economical lighting from very low wattage LEDs. The Bright White will promote lush plant growth without encouraging troublesome algae and creates a beautiful ripple effect on the surface of the water. The Blue Moon LED creates a softer, more relaxed light for night time viewing. Two switches on the top of the hood control the lighting, they both have an inbuilt automatic sun and moon rise start up. This filter is so easy to maintain. Simply remove the floss/carbon filter every 28 days and replace with a new one. The Algaway pad reduces unsightly algae by removing phosphate, algaes favourite food. These convenient cartridges just simply pull out and slot in no mess or effort involved. A Deltatherm heater (also included) acts like a central heating system to maintain a stable water temperature for tropical fish. The heater comes from the factory set at 24°C, the ideal temperature for most tropical fish, but can be set to any temperature between 20°C and 35°C by using the adjustable thermostat on the top of the product. All in all a great way to set up a stunning aquascape and enjoy your beautiful fish. 32 litre glass aquarium; Aquarium hood; 18 x 0.2w Bright White LED; 4 X 0.2W Blue Moon LED; CF1 Internal Cartridge Filter; 100 Watt Deltatherm heater. Please note this does not comes with cabinet. This is aquarium fish tank only. High performance led lighting for daytime viewing. Easy care, effective cartridge filter. Curved 3mm float glass for panoramic viewing. Ideal for tropical or temperate aquariums. Float glass is virtually distortion and defect free, making it suitable for various glazing applications, including buildings and homes. To enhance fish colour and promote healthy plant growth, the aquarium kit comes with two LED lights; one Bright White 0.2w and one Blue Moon 0.2w. The Key to Aquarium Success. Day 1: Building the System - Unpacking your aquarium, adding the substrate, fitting the filter and heater to your aquarium, preparing and adding the wood, treating and adding the water. Day 2: Planting the Aquarium: Adding your plants, setting up and turning on the lighting. Days 3 to 14: Allowing the water to mature and testing the water at the end of week 1 and week 2. Weeks 3 and 4: Bringing the Aquarium to life: Tidying up the tank and testing the quality of the water. Weeks 5 to 7: Increasing the Fish Population: Adding your second fish. Weeks 8 to 12: Towards a Stable System: First small water change, testing the water, feeding your plants and adding your third fish. Week 12: The Finished Display: Cleaning your tank, testing the water and admiring your aquatic paradise. 50cm wide, 32 litres (50cm wide x 25cm deep and 30cm high). 60cm wide, 60 litres (60cm wide x 30cm deep and 39cm high). 75cm wide, 87 litres (75cm wide x 30cm deep and 45cm high). High performance LED lighting for daytime viewing. Curved float glass for panoramic viewing. Everything you need to get started! The CF system represents the most versatile, comprehensive and easy-to-use filters available. With its uniquely easy locating hanging cradle, the filters are easy to fit and with the easy access open top these filters are also a dream to maintain. These filters have everything required to look after a successful aquarium and include; Ceramic Biological Media, patented Floss & Carbon Pad and a first to market additional algae prevention pad helping to reduce the phosphate levels in the aquarium. Tropic 50cm comes with CF1 - B00HFTFP3Q. Tropics 60cm and 75cm come with CF2 - B00ITQKZIE. Interpet has been at the forefront of aquarium technology for over 60 years and has unrivaled experience in the aquarium heater market. When the heater is in operation the red light will indicate when the heating is taking place. Once the desired temperature has been reached, the integral thermostat will turn the heater off. This can clearly be seen as the red light will turn off. 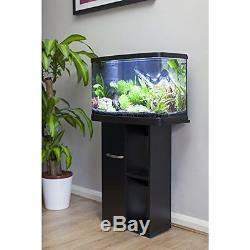 The Deltatherm aquarium heater is double insulated and fully submersible. It is ideal for marine or fresh water fish. You should never adjust the temperature by more than +/- 2°C at one time if there are fish in the aquarium. 0.2w LED lights Blue Moon and Bright White (included). The Tropic LED aquariums are supplied with bright white 0.2w 10,000K LEDs and 0.2w blue moon LEDs. Bright White for lush plant growth without encouraging algae. Creates an attractive ripple effect. Blue Moon for softer, more relaxed night time viewing. The lighting is controlled by two stylish touch buttons which are located on the top of the low profile aquarium hood. The bright white LEDs have an inbuilt automatic sun rise start up. This gradually increases the light intensity to prevent sudden light shock, which reduces fish stress. The LEDs themselves are also IP68 waterproof which ensures the design is completely safe and even submersible. CF1 and CF2 one and three month service kits available. Simply remove the floss/carbon filter and Algaway pad every 28 days and replace with a new one. CF1 One month service pack B00HGE8XXE - contains 1 x floss/carbon cartridge, 1 x Algaway pad. CF1 Three month service pack B00HGEDL6I - contains 3 x floss/carbon cartridge, 3 x Algaway pad. CF2 One month service pack B00HSMME0W - contains 1 x floss/carbon cartridge, 1 x Algaway pad. CF2 Three month service pack B00HSMMFK6 - contains 3 x floss/carbon cartridge, 3 x Algaway pad. There is usually a place in every home suitable for an aquarium. Its location can have a great influence on how successful an aquarium is. It might mean changing the layout of an entire room to accommodate the aquarium in its best position. The position of the tank in the room is often a compromise, since it is rare to find the optimum conditions. Bear in mind that fully set-up tanks are extremely heavy. Since 1 litre of water weights 1 kg (1 gallon weighs 10lbs), that is without the weight of the tank itself, cabinet, rocks, gravel, etc. Therefore you will need to be sure that the floor where you set up your aquarium is sound and level. Choose a quiet area, such as an alcove, provided you have access to service the tank and to an electricity supply. Never locate close to a door or any part of the house where there is heavy passing human traffic, such as a hallway. Your aquarium should also be away from too much light so in front of a window or in a conservatory is unsuitable as the aquarium will get too hot in the summer or too cold in the winter. Natural light also promotes the growth of unsightly algae. Without filtration your aquarium will become dirty and smelly, not to mention toxic for your fish. Filtration and aeration in any aquarium is essential to maintain the quality of the water, and also remove any particles which may cause illness in your fish whilst ensuring that oxygen levels are kept to the optimum. The ceramic biological filter media provides a large area that beneficial bacteria can colonise. They break down much of the waste matter produced by the fish (see the nitrogen cycle below). The presence of other materials, such as activated carbon, can be incorporated to remove other toxic substances. Always turn off the power to your filter when carrying out maintenance. The cartridge filters are designed so that the replacement cartridge and bio holster that holds the Algaway pad can be easily removed without getting your hands wet. Most of the daily tasks take only a few minutes. Check that the internal filter is working properly. Feed the fish, making sure that they all receive some. Check that the lights are working. Every 7-14 days Test the water for pH, ammonia, nitrite and nitrate levels. Clean the front and side glass of the aquarium to prevent a build-up of algae. Clean the substrate with a gravel cleaner. Make a 15% water change and refill the aquarium with conditioned water at the same temperature. Feed plants with liquid fertilizer. Every month discard the old filter cartridge and replace with a new one ensure the cartridge is fully inserted the correct way round (FRONT on tab facing forwards). Remove the holster from the filter and slide out the old Algaway pad and discard. Insert the new Algaway pad into the holster and reinsert into the filter body. Three monthly checks are slightly more involved. As well as the filter cartridge replacements you will need to clean the intake cage and impeller. Once a year the impeller will need to be replaced, follow the three monthly impeller maintenance above and insert a new impeller into the impeller chamber. Code 36635 for the CF1, Code 36636 for the CF2. This will help you identify the problem and apply the best remedy. Symptoms: Mouth rot Cottonwool-like growths around the mouth could be a bacterial or fungal infection. Use a treatment that will tackle both types of infection. Interpet Anti Fungus and Finrot Number 8 Treatment. Symptoms: Swollen eyes These may be caused by an internal bacterial infection and can be seen in fish affected by dropsy. A tumour behind the eye could also cause this symptom. Interpet Anti Internal Bacteria Number 9 Treatment. Symptoms: Slime patches These are caused by the fishs immune response to protozoan skin parasites. In severe cases, the slime (mucus) patches will cover most of the body. May be accompanied by flicking behaviour and clamped, folded fins. Interpet Anti Slime and Velvet Number 7 Treatment. Symptoms: Fine gold spots Very fine gold spots are typical symptoms of velvet disease caused by a skin parasite. Treat quickly with a targeted anti-parasite remedy. Interpet Anti Crustacean Parasite Number 12 Treatment. Fungus Any skin damage may become infected with fungus to produce cottonwool-like growths. To be sure, use a medication that will deal with both external bacteria and fungus. Symptoms: Ragged fins Ragged edges to the fins, which may also be red and sore, are signs of a bacterial infection known as finrot. Use an antibacterial treatment to stop it spreading to the body. Damaged fin tissue may regrow once the infection has been cured. Symptoms: Protruding scales Swelling with scales protruding like a pinecone, commonly known as dropsy, is caused by an internal bacterial infection that inhibits the fishs ability to control the level of water in its body. The item "New Interpet Tropic LED Complete Aquarium Tank Kit, 32 Litre, 50 cm, Fish Light" is in sale since Tuesday, September 13, 2016. 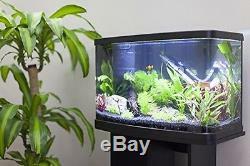 This item is in the category "Pet Supplies\Fish & Aquarium\Aquariums". The seller is "theminimalistshop" and is located in Multiple Locations. This item can be shipped to United Kingdom, United States, Japan, Canada, Ireland, Australia, Germany, France, Greece, Italy, Spain, Russian federation, Austria, Belgium, Bulgaria, Croatia, Cyprus, Czech republic, Denmark, Estonia, Finland, Hungary, Latvia, Lithuania, Luxembourg, Malta, Netherlands, Poland, Portugal, Romania, Slovakia, Slovenia, Sweden, New Zealand, China, Israel, Hong Kong, Norway, Indonesia, Malaysia, Mexico, Singapore, South Korea, Switzerland, Taiwan, Thailand, Brazil, Chile.